My first training article was published almost 10 years ago. When I started writing my primary focus was telling people how to get bigger and stronger across their entire body. Articles such as Anti-Bodybuilding Hypertrophy, Total Body Training, and the Waterbury Method became huge hits on the internet with hundreds of thousands of hits. However, I swore I’d never write an arm training article. It probably wasn’t the smartest marketing strategy since 99.9% of guys want bigger arms, but I didn’t care. The subject just didn’t interest me. Don’t get me wrong: in my late teens and early 20s I wanted bigger guns as much as the next guy. And probably just like you I thought the latest newsstand muscle magazine was going to hold the key to a magical arm routine that would suddenly pack meat on my skinny arms (my upper arm girth measured a pathetic 13.5″ when I started training them). After years of frustration I came to a conclusion that I hold to this day: Curls are curls. Sure, some variations are slightly better than others, but in the end they’re all basically the same. In other words, if you’ve been doing curls there’s not a variation in this universe that will suddenly make them grow. Yet, I was able to naturally increase my upper arm girth to almost 20 inches once I figured out how to put the puzzle pieces together. Now, before you think this article is going to be a slam against arm curls and direct arm training in general, it’s not. To this day I do some type of direct arm work because it does help. 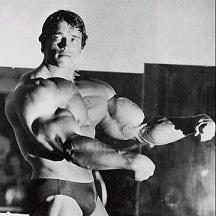 However, it has its limitations and I never would’ve built big arms if I just kept doing curls and triceps extensions. I can’t blame a guy for wanting bigger arms, and there’s so much misinformation out there that I decided it’s time to break my personal vow and set the record straight. After all, I wish I would’ve had this information back when I was searching for my two tickets to the gun show. So here are the surefire steps that will make your arms grow. 1. “Row up, Curl Down:” This is a phrase I coined when I started training guys who wanted more muscular arms. The concept is simple: all rows and upper body pulls are performed with your palms up and all curls are performed with the palms down when you’re on an arm specialization routine. The biceps can handle a lot more load with rowing variations than with curls, so an effective strategy to overload your arms is by pulling with a hand position that maximally recruits your biceps – with the palms up. For all curls, the palms should be down (wrist pronated) to target the forearm extensors and brachialis muscles – two sets of muscles that are woefully undeveloped on almost every guy. Strategy: For one month perform all upper body pulls with a supinated grip and all curls with a pronated grip and your arms will grow. 2. Strengthen the Posterior Chain: The collection of muscles that run from your hamstrings to the back of your neck form the posterior chain. These consist of the biggest, strongest muscles in your body. As the Russian strength coaches like to say: A strong man is strong in the back of his body. When you strengthen the posterior chain with exercises such as deadlifts, squats, swings, and cleans it increases the neural drive to your upper arms. Put another way, when your nervous system knows it has a strong foundation of support it’ll allow you to lift heavier loads with your arms. Every guy I’ve ever put on a deadlift specialization cycle was able to make his upper arms grow faster than ever before after adding 50-100 pounds to his pull. Another effective strategy is to pair direct arm work with heavy squat variations. The front squat/curl pairing is one of my favorites. Perform 3-5 reps of the front squat, rest 45-60 seconds, then perform a set of curls. You’ll be amazed how much stronger you’ll feeling while curling when you do it after the front squat – an exercise that drastically increases neural drive to your legs, hips and core. A heavy reverse lunge works well, too. Pairing the deadlift with curls isn’t as effective since your biceps need to stay fresh while you’re pulling. My friend, Pavel Tsatsouline, is known for demonstrating the immediate neural boost to your gripping strength when you maximally tense your glutes and abs while squeezing a person’s hand. This CNS trick works awesome. Strategy: Pair direct arm exercises with squat and lunge variations. 3. Fatten Your Grip: Performing upper body exercises with barbells and dumbbells that have a fat grip is a excellent way to add size and strength to your forearms and upper arms. However, it’s always been difficult to find fat grip dumbbells because they’re very expensive. Luckily, there’s an easy, affordable solution: Fat Gripz. This is one of the best training tools I’ve come across in years. Just slip the Fat Gripz over a barbell or the handles of dumbbells and you can instantly reap the benefits of fat grip training. I have my clients perform all curls, extensions, rows, pull-ups, and many deadlifts with Fat Gripz because they’re durable and they don’t compress like many of the inferior knock-offs. You can find Fat Gripz by clicking HERE. 4. Strengthen the Neck Extensors: There’s a direct correlation between the strength of your neck muscles and your overall strength. This is especially true with arm exercises, for reasons that aren’t fully understood. The mechanisms aren’t as important as knowing that it’s another CNS response. When the neck is weak it limits neural input to your limbs as a protective mechanism. Strategy: Buy a head harness and perform 3-4 sets of 13-15 reps of the neck extension 2-3 times per week and watch your arms grow. 5. Try High Frequency Training (HFT): If underdeveloped arms are your problem (and they most certainly are if you’re still reading this) it’s important to understand that stubborn muscle groups require extreme strategies. If training your upper arms two or three times per week isn’t working, try training them six times per week. Some strength coaches scoff that doing more curls is a waste of time if curls are working to begin with. I understand their argument but I don’t agree. Some muscle groups require a lot of volume to grow – much more than what you’re currently exposing them to. Since biceps and triceps are small muscle groups they can recover quickly and there’s little risk of burning out your CNS when you up the frequency. The trick to making HFT work is to add your extra arm work at a different time of day than your regular workout. Sure, you can still do arm training in your current routine – let’s say it’s three full-body workouts per week – then you’ll add three more sessions at least 6 hours before or after those workouts. Strategy: Perform 4×6, 5×5, or 8×3 for curl and triceps extensions variations for 3-4 extra workouts each week. 6. Increase Your Body weight: Fast muscle growth requires you to stay anabolic. It’s very difficult to remain anabolic when you’re consuming fewer calories than your body needs each day during cutting phases. The only time my arms got bigger was when I was trying to add body weight to my frame. In order to stay sane, keep in mind that the scale should be going up when you’re trying to fill out your shirt sleeves. When my arms were biggest I weighed 286 pounds. When I started lifting weights I weighed 160 pounds. So it took a lot of body weight to add six inches to my arms, but the concept can’t be refuted…or can it? You can add size to your upper arms without putting on a lot of extra body weight but it requires a serious investment of time and energy. Basically, you’d need to start training for the rings event in the Olympics (I’m sort of kidding). Those guys have the best arm development on earth but they don’t have work, school, and family demands. If you’re fortunate enough to spend hours each week on the rings, start doing it. If you’re not one of those guys, start eating more high-quality nutrients. Strategy: Add an avocado, a few yams, and wild fish to your daily diet. Very good article. Just like you have said in your book “Huge in a Hurry”. Thanks Chad. How about an article on Delts and Back? I always thought chin-ups, (where you’re essentially curling your body weight), were a good biceps movement and pull-ups hit the lats and shoulders. Your “Row Up Curl Down” paragraph seems to say that pull-ups, (palms down or pronated) would hit the biceps more. Or am I misreading? Nice article, Fat Gripz are next on my list of tools for the gym. George, yes the chin-up is a great exercise for the biceps, that’s why I said: all rows and upper body pulls are performed with your palms up. Allow me to preface this comment/question by saying that I have the utmost respect for you and your work and am not writing this to be an internet jerk, but rather, I am merely trying to improve my overall understanding of things….. Some coaches feel the neck should never be training for conditioning with aggressive repetition or load. This would appear to place your recommendation in point 4 in direct opposition to this principle. Would it be preferable to simply strengthen the neck extensors isometrically rather than performing dynamic work? That would seem to be the compromise that would respect the point you were making about neck extensor function and arm work. I’d appreciate any further thoughts you may have on the matter, and I thank you kindly for your time and help. CW: Sam, I respect your query into this subject because neck training isn’t something to be taken lightly. There are numerous neck training machines and methods that make me cringe. However, a few sets of 13-15 a few times per week is anything but aggressive neck training. Plus, neck extension (when performed correctly) is a very natural movement. I agree that it’s unwise to train the neck aggressively, so we’re on the same page. Strengthening the neck is essential for athletes, especially those in combat sports. The carryover, however, to guys who simply want to get bigger/stronger is an added bonus. I’m a fan of isometric neck training, too, because it spares the cervical spine – much like Dr. McGill’s core strengthening methods spare the spine. Great article, it makes total sense. I’ve noticed significant gains in my arms and shoulders due to these techniques which I learned from you. I’ve been doing serious neck work for at least a year and raised the frequency lately because I saw it as the right thing to do to equalize it with my other body work. What you just said in this article makes it click for me and I understand that I was doing more good than I thought. Thanks, Chad. Hey Chad, I’m not sure you’ll see this comment on an old post, but I thought I’d try anyway. I’m using your book HIAH, and just finished the GB phase. Got to 214 lbs from 204 (net gain, lost lots of fat too) and wanted to get right into HFT. However, I do not want to do the biceps/triceps program that is in there. I want to use that as a template to design my own, but I was wondering if it is feasible to do one for shoulders/chest. Would that not be working the arms too much over the period? Since it’s hard to isolate those groups without involving the arms in BOTH? I hope this makes sense. Thanks! CW: Carl, read pages 142-143 in HIAH. There I outline other ways to take advantage of my HFT template with other exercises. In a nutshell, you can use the same “arm” template but with other exercises in place of it (for other muscle groups). Stick with the program template (loading, reps, etc) but feel free to use different exercises that will target your shoulders and chest.